The Kizlyar Supreme, which is making its way into the knives world, is implementing its production capacity by expanding it significantly, in order to meet the growing demands of market, without ever losing sight of the quality of their products. The Kizlyar Supreme is currently working on new products and among these, in preview for us, the URBAN model. It is a fixed blade and full tang knife of small size. It is designed to be worn daily and comfortably in all circumstances (of course in countries where the law permits) to use it as utility backup knife. Thanks to its design, the URBAN meets a wide range of users. The first thought that runs through the mind after a quick observation to the knife is what the celebrated English historian Edward Gibbon wrote in "Memoirs of my life": "Style is the image of personality." This phrase sums up the philosophy that Kizlyar Supreme was able to infuse into this knife, which expresses all its character through a simple but refined design, made even more attractive thanks to finish surface that gives the product the style and class that sometimes only the simplicity is able to transmit (we can say that sometimes "less is more"). 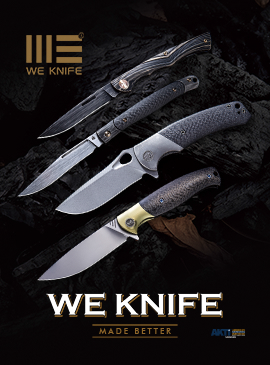 The handle consists of two ergonomic Micarta scales, which give a comfortable grip of the knife, as well as represent a continuum of blade style. 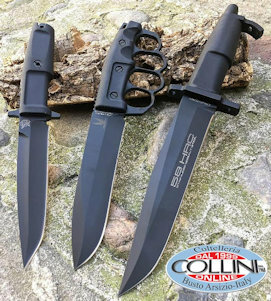 The knife, with overall dimensions of 202 mm, is also available with blade made of AUS-8 steel with the same finish, or with black finish and Micarta handle with green shades. The kydex sheath is molded around the blade and holds the knife with a pressure retention mechanism. Thanks to the belt clip that comes with the sheath, knife can be easily clipped to the belt without having to unfasten it. Furthermore the belt clip can be easily positioned in various configurations in order to allow also to be positioned horizontally on the belt. Since this is a preview, the sheath was a prototype, but in the commercial version it will be substantially identical in shape although with some improvements from the point of view of blade retention (which in the prototype wasn't optimal). In countries where it is not permitted to wear a knife in the urban context, this knife loses the connotation that had been given by the manufacturer (hence the name URBAN). Since, however, the product has a very versatile conformation, it can be seen as a small utility backup for outdoor or even for hunting activities. The sharpening made ​​by Kizlyar Supreme is well made, the cutting tests have given positive results on all materials.